Established in 2002, Hansen Pole Buildings was founded with the intention of being the first provider to offer frame kits online. With a focus on providing the best buying experience possible, Hansen prioritizes material efficiency while ensuring their buildings meet the requirements of climactic conditions. Pole building homes have come a long way over the last decade. At one time, residential pole buildings were unattractive and looked more like metal warehouses than homes. Today, it’s hard to differentiate between a conventional stick-built home and a residential pole building. 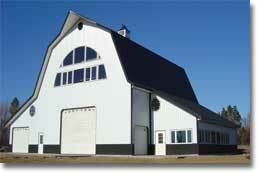 The average pole barn cost is significantly lower than conventional homes. Costs are still lower even when additional details are added, such as overhangs, wainscot, and decorative windows and doors. Why are Hansen pole buildings more affordable? Pole buildings are easy to maintain and highly durable compared to other construction methods. With no exposed wood, there’s no need to worry about rot and termites – two significant and expensive issues that affect stick-built homes. Roofing and siding on metal homes is also virtually maintenance-free because there are no shingles to replace and there’s no siding to paint. 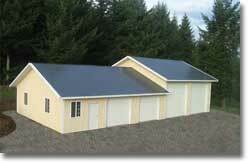 All Hansen pole barn packages can be customized to meet your needs and budget. Choose the layout and details you want without incurring extra charges. You may be surprised to learn that pole barn homes look no different than conventional homes. They can be outfitted with siding and a roof to make it blend into any neighborhood. And with so many designs to choose from, you’re only limited by your imagination. The great thing about Hansen is that the company is very transparent about the cost of their buildings. 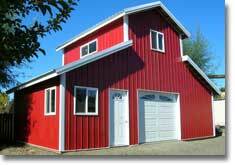 Hansen pole barn prices range from around $4,000 to over $40,000. Even at the highest price, the cost of constructing a metal home is significantly lower than a conventional home. All of the prices listed above are the base prices for each plan, but if you’re just looking for a simple building, the cost shouldn’t be much higher (if at all higher) than the base price. Because you plan on using the metal building as a home, you want a variety of building styles to choose from. Fortunately, Hansen offers a number of designs, and the option to customize the look of your home if you wish. The classic gable roof is the most popular option at Hansen. It’s simple, affordable and offers a traditional design. If you’re on a tighter budget, a gable roof is a great option. Similar to the gable roof design, the monitor roof is ideal for RV storage and homes because it offers a tall center section. The classic barn roof, the gambrel style comes at a slightly higher price, but offers a number of window and peak options that may appeal to homeowners. One thing that may contribute to the cost of your residential metal home is customization. Hansen offers a number of extra features that can help transform the look of your building, but these extras will add to the overall cost of the kit. When purchasing your kit, you have the option of adding enclosed or open overhangs. Just as their names suggest, enclosed overhangs are enclosed with soffit material to protect the framing while allowing for ventilation. Open overhangs are open, and the framing support of the roof is visible. Both entry doors and overhead doors can be added to the building. Feel free to add as many entry doors as you want – and you can even customize the width. Overhead doors are just like conventional garage doors, which slide up and over into the interior of the building. These doors provide extra security, but may not be the best option for a home – unless you’re looking for a unique look. Commonly used in agricultural environments, Hansen’s sliding doors are made of all steel for extreme durability. Choose between a single sliding door, or bi-parting sliding doors. Also known as porches or lean-to’s, a side shed provides additional covered space. A variety of options are available, from fully enclosed to roof only, partially enclosed or wrap-around. A carport can also be added to the building, which is simply an extension of the gable endwall of the building. A carport adds some extra valuable space without adding too much to the cost of the home. What to Expect with Your Kit? When purchasing your home kit from Hansen, you can expect to receive just about everything you need to get your building constructed. Of course, you’ll still need to hire pole barn contractors if you don’t plan on building the home yourself. 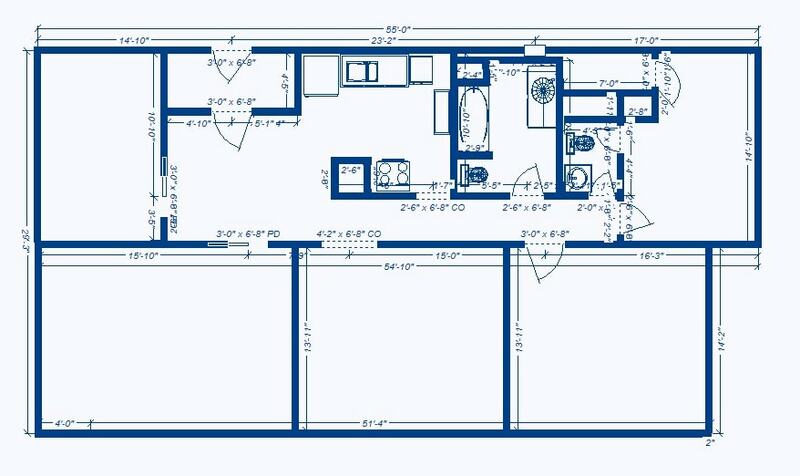 Two sets of large building plans (2′ x 3′). These plans include calculations and stamped engineer plans. Premium quality framing lumber – 2×6, kiln dried #2 or better. Steel framed sliding and entry doors made to withstand the elements. Double truss system, which reduces material costs and construction time. Premium trim package for the: fascia, building corners, sliding door tracks, varges and base. 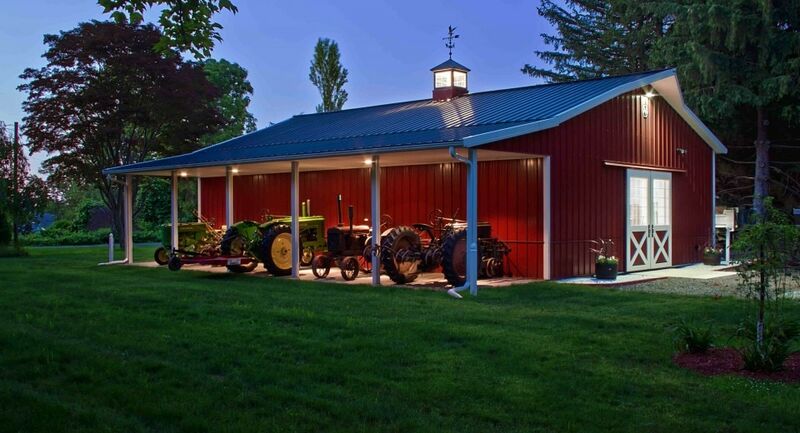 As a leader in the metal building industry, Hansen is a great choice when building your pole barn home. Hansen offers a free quote on all of their metal buildings – including homes – so you can get a better idea of how much it will cost you. With low starting prices, you can have a brand new home that looks just like any other home on the block for a much lower price.